I am a student at Wrexham’s Glyndwr University. For three months I had the pleasure of being involved with the Enclosure Maps Project at Denbighshire Archive Service, along with my fellow student, Phil Cooper. Our involvement in the project was very much thanks to Sarah Roberts, the Lead Archivist responsible for Digital and Outreach Services. Our university course required us to undertake a work placement as part of our degree course. At Glyndwr University all students on the History Degree programme have the opportunity to undertake work experience in a history-related workplace setting. Phil and I asked to work at Denbighshire Archives Service because we are both interested in archive work as a possible area of future employment, following the completion of our degree course, and we are very grateful for the opportunity Sarah gave us to work on this challenging, demanding, yet ultimately, very exciting project. Enclosure took many forms during its long history. Enclosure, simply defined, is the physical enclosure of areas of land but the enclosure process also involves a legal process which changes the basis on which the land is held. After enclosure the land is no longer held in common, but is held in severalty. 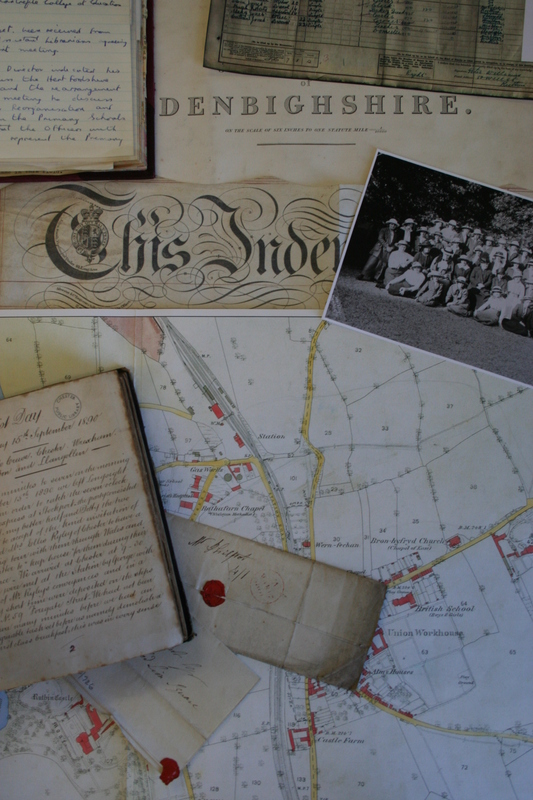 The awards and maps held at Denbighshire Archives Service are evidence of the final form of enclosure, Parliamentary Enclosure, which occurred during the nineteenth century in Denbighshire. In Wales Parliamentary enclosure happened much later than in England. ‘For whatever reason, although there was a Welsh Parliamentary enclosure as early as 1752…over 50 per cent took place after 1840.’ Parliamentary Enclosure was effected by the passing of a bill in Parliament. Until 1801 this had involved the passing of an individual Private Enclosure Act for each enclosure but from 1801, under the General Enclosure Act, this changed and the process could be accomplished much more easily and cheaply. The process was further streamlined under the 1845 General Inclosure Act which established a national enclosure committee, supported by ‘…local assistant commissioners and surveyors, who acted as valuers and held local enquiries into each proposed new enclosure project’ The earliest enclosure maps in the Denbighshire archive covers the enclosure of land in Cilcain and Llanferres in 1801, while the latest map covers the two enclosures of land in Tir Abbot Ucha Township in 1872 and 1877. The project shares many of the features of the Cynefin Project. Cynefin is aiming to make Tithe maps for the whole of Wales available online and this project aimed to make the Enclosure maps for the smaller area of Denbighshire available online in a similar way. The project was divided into three stages and was carried out in partnership with Flintshire Record Office and the National Library of Wales at Aberystwyth. It was funded by CyMAL (Museums, Libraries and Archives Wales, now MALD). In the first stage the enclosure maps, held at Denbighshire Archives as part of the Quarter Sessions records, were sent to Flintshire Record Office to be repaired and conserved. Once this task was complete the maps were then sent to the National Library of Wales where high quality digital images of the maps were produced using their state of the art facilities. The maps were then returned to Ruthin, where the final stage of the project began, and it was at this point that Phil and I became involved in the project. The final stage of the project involved the digital images being incorporated into the archives’ new website and when we commenced work this website was almost ready to go online. Our primary task was to match the enclosure maps to later historical and modern maps, so that the area covered by the maps could be identified. Our first task, however, was to inspect each map and note the names of any properties marked on the map. Hopefully this will be useful to individuals researching the history of their house. Once this had been done we could move onto our primary task which was a little more complicated, though it certainly gave us an insight into the painstaking and demanding nature of archive work. It involved a two stage process in which the area covered by each enclosure map was identified using maps available on the Peoples Collection Wales website. This then enabled us to find geocodes for each map using gridreferencefinder.com. This information was then added to the catalogue record. It was also used to create an identifying point on the online search map of Denbighshire, on the archives new website. This process thus linked maps across three centuries. For some maps it was easy both to identify the area which the enclosure map covered, and to find a common and enduring point. Some maps had easily identifiable markers to help the process of identification, a river, a property, a named mountain or hill, and it was easy to spot the similarities between the enclosure maps and the later historical, and modern day maps. However, for other maps, maps which were more featureless, the process was much more complicated, time consuming and frustrating and they required a little more detective work before their location could be identified and a common point found. The identification of a common, enduring point often proved the most problematic aspect of our task. It was sobering to reflect that the common point we needed to identify had to have existed for at least one hundred and fifty years and it was for this reason that this was one of the most frustrating yet rewarding parts of the project. Finding something that has existed, and been mapped, for that length of time is not easy. It might be thought that houses or house names endure but this was not often our experience with the enclosure maps. Many individual properties marked on an enclosure map had simply disappeared by the time of the next mapping, in 1868. Was this an effect of the enclosure process? Perhaps this is an area for future research. Surprisingly, at least for me, one of the most enduring features on the maps, besides geographical features, were the roads and road patterns. These were often the only common mapping points that could be identified across the centuries, but identifying them was not always simple. It often involved much flicking, between the images of the enclosure maps, and the later maps, to discern whether the two road patterns really were identical or if the similarity was just down to wishful thinking, or frustration, on our part. Nevertheless this process did provide some very satisfying ‘Eureka moments’ when finally a match was found. Some maps were particularly troublesome and one particular map stands out in this respect. It is the map QSD/DE/16e which covers the area Bryniau Gleision, near Trofarth. It had no named properties on it, only one road, and no outstanding features whatsoever. I despaired of ever identifying the area, let alone finding a common point. I did, however, find both eventually and I did it by using the unusual shape of the fields on the enclosure map. I was able to match them to the modern day fields, which still retained their unusual shape, and which was revealed by the modern Bing hybrid satellite map. These were wonderfully satisfying moments during the project but we were also very fortunate that the end of our work placement also coincided with the end of this very long project. On our last day at the archives we were shown the fruits of our labours, and the labours of everyone else involved in this project. We were given a preview of the archives’ new website which featured the digital images themselves and a search map based on our patiently plotted grid reference points. It was humbling to realise how much time and effort had been put into this part of the project, yet the only direct evidence for all our effort, for the entire placement, was a few dots on a map. Nevertheless these dots will greatly aid those searching the website for information about the enclosure maps and viewing the website engendered a surprising feeling of achievement at the end of our contribution to the project. We felt proud to have played a part, even though it was a very small part, in the enclosure maps project. So, what has the project achieved? Well, viewing these enclosure maps will be much easier in the future. Some of these maps are huge, larger than the searchroom tables. Viewing these maps would undoubtedly be both risky for the maps, and difficult for the viewer. Maps are, at their heart, a source of information and these high quality digital images make examination of the enclosure maps much easier. The maps will also now be accessible, even if you cannot visit the archives. Hopefully this will mean that more people will come into contact and engage with these fascinating maps, which represent, and are evidence for, an important part of Wales’s past.